The Church of the Flying Spaghetti Monster in Gainesville, Florida in the USA has said that it has temporarily suspended plans for a mass Quorn burning event in a dispute over the site of the new meat free Zero Ground Meat Kiosk being built on Manhatten Island. The subject of Quorn has been controversial in the US over fears that followers of a Quorn based diet exhibit allergic reactions, with women being forced to cover themselves from head-to-toe in black sheets and some on extremist Quorn diets being driven to violence. Little Italy has gained almost sacred status in American culture having seen the murders of many spaghetti eaters. The Church of the Flying Spaghetti Monster is adamant that the celebration of other vegetarian dishes in the area would be seen as a triumphalist move from those that have taken against the Pasta way of life. 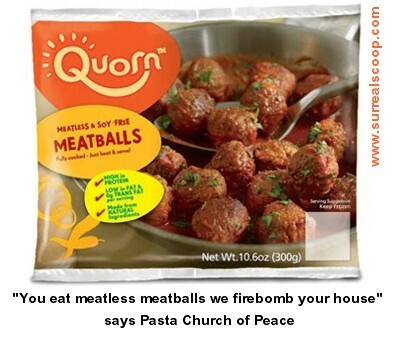 Across the world the Quorn burning plan has been condemned by religious and political leaders fearful that it will insight Quorn followers to retaliate, perhaps violently. As America braces itself for a day that may end in conflagration, the Pasta at the centre of the controversy is prepared to suspend the burning as part of ongoing talks over the future of the Zero Ground Meat Kiosk.